Simplify easy folding durable step stool for kitchen, bathroom and bedroom. 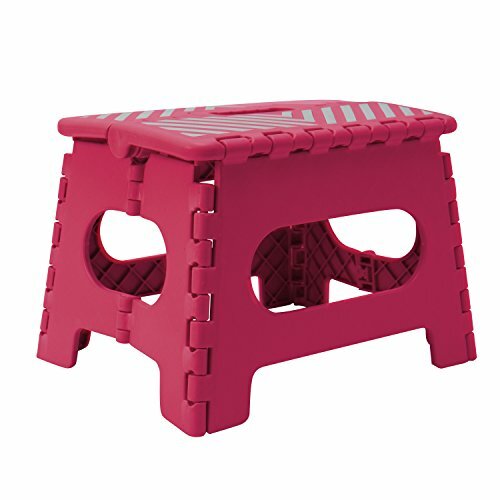 Its Unique, grip-dot textured surface makes the step stool safe for everyone, even for kids. This folding step stool you can carry anywhere, like park, garden, beach, and playground. The lightweight, but sturdy folding step stool is easy to use because it opens with one flip of the hand. It folds flat for convenient storage and has a built-in carry handle, making it easy to bring from room to room. It features an anti-skid bottom and slip-resistant step pads for extra stability and its great for potty training or reaching the sink. Color: Gray. Size: 12.5" x 9" x 10". MAXIMIZE YOUR STORAGE SPACE: Do you need a new step stool,but you don't have enough storage space? Don't worry, because this collapsible one step stool is collapsible and it doesn't occupy too much space. The measurements of the stepping stool are 9" W x 11" D x 13" H, and when it folds,it is very slim and it can fit anywhere! EASY TO SET UP AND FOLD:Are you in a hurry to get something from the top shelf? Then grab the folding step stool and unfold it. It won't take more than a couple of seconds to set it up! And when you no longer need it, you can fold it fast and with ease. The step stool is so easy to open and fold that even your kids can do it when they need to reach something, go to the toilet or wash their hands on the sink. CARRY IT AROUND WITH EASE:Do you want to carry the easy step stool from one room to another or maybe outside? That's easy, because when the collapsible stepping stool is folded, it has a handle to help you carry it around with ease! The smart design of the one step tool is very practical both when the stool is set up and when it is folded. DURABLE AND STURDY BUILD:Made with heavy duty plastic, this folding step tool will never bend, snap or break. You can use it daily and for many different reasons. And you can stand on it without any fear, because the sturdy and strong build of the plastic step tool can withstand your weight without any problems. Your safety is guaranteed! YOU'LL NEVER SLIP AND FALL:You can step on the step stool chair wearing any shoes you want or even barefoot. Thanks to the nonslip stepping surface, there's no chance that you'll slip and fall. This anti-skid surface has been specially designed to effectively prevent you from slipping. The folding step tool is 100% safe, so you can let your kids use it and you can have some peace of mind. If you have any questions about this product by Simplify, contact us by completing and submitting the form below. If you are looking for a specif part number, please include it with your message.